Heading into the season, Notre Dame embodied the very essence of an “under the radar” club, coming off a 26-32 campaign a year ago and a 10-20 finish in the ACC. 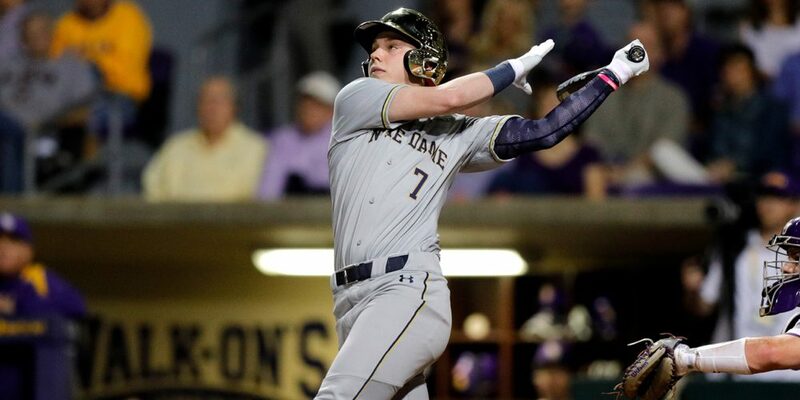 On top of that, the Fighting Irish had to replace five pitchers who were drafted in the top 16 rounds last year, so this figured to be one of the youngest clubs in the ACC, with unproven underclassmen playing very prominent roles from the outset. But in the preseason, the Irish coaching staff was cautiously optimistic. They felt good about their young talent, but more than that, they felt good about the character of the club. That underdog mindset can be a real blessing, and it will be interesting to see how the Irish adjust to added national attention after pulling off the most shocking series win in college baseball in Week One, taking two out of three from LSU at Alex Box Stadium. Now the Irish will try to maintain their focus heading into a four-game weekend tournament in San Antonio, with games against Saint Louis, Incarnate Word and Purdue. 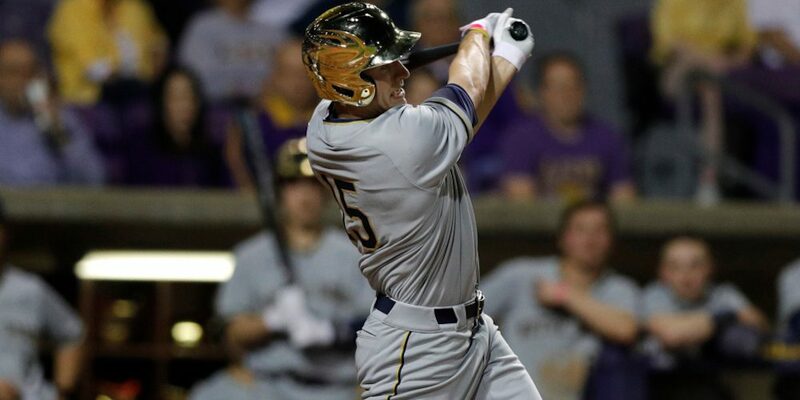 It was particularly impressive how Notre Dame bounced back after building a 6-0 lead through five innings Friday, only to see LSU storm back and win 7-6. There was no hangover from that brutal loss on Saturday, as the Irish put up a seven-spot in the third inning en route to a convincing 10-5 win. And just as importantly, there was no hangover from Saturday’s big win when Sunday rolled around; Notre Dame kept its foot on the gas pedal, winning the rubber game 11-3. Notre Dame out-hit LSU in all three games, 33 hits to 20 overall. The Irish also played error-free defense all weekend, while LSU committed three miscues. Aoki said the mental makeup and even the roster composition of this team is perhaps surprisingly similar to that of his 2015 Notre Dame team, which opened the season with a series win at Oklahoma en route to a 37-win campaign and a regional berth. Both teams counted on talented young players to mature quickly, but both also had a strong veteran core of upperclassmen who cared more about the team than their own individual fortunes. This year’s Irish club has one established star with a chance to be drafted in the top three to five rounds this June: center fielder/righthander Matt Vierling, a mature hitter with some pop and above-average speed, along with a 90-93 fastball and a wicked 87 mph cutter that he relies heavily upon. A few weeks ago, the Irish anticipated that Vierling would serve as their closer as well as the everyday center fielder, but he struggled at the plate (2-for-13) and in his one mound appearance (0.1 IP, 1 H, 2 ER, 3 BB) in the first weekend. It’s only one weekend, of course — Vierling will bounce back, and he will be Notre Dame’s best player once again as a junior. Four other upperclassmen join Vierling to form the backbone of the lineup, and they all had big weekends in Baton Rouge. Junior second baseman Nick Podkul (5-for-9, 6 RBI) is a mature, physical righthanded hitter who plays rock-solid defense at second base. He was a wrecking ball against LSU, and he is a pro prospect with a shot to be drafted in the top 10 rounds with a strong spring. Shortstop Cole Daily (5-for-13, 3 RBI, 4 SB) is a dynamic athlete whose speed is a real asset in the lineup. He helped stabilize Notre Dame’s defense by taking over at shortstop midway through the 2017 season, then earned all-star honors in the Northwoods League over the summer. He and Podkul form a very strong middle infield duo. Joining Vierling in the outfield, senior Jake Johnson (4-for-13) is an on-base machine with a mature, patient approach at the plate. He posted a .401 OBP as a junior last year, and he drew five walks in three games at LSU. In the other corner, junior Eric Gilgenbach looks poised to harness his big-time raw power after smacking three homers and driving in nine runs this weekend. Ristano said a few weeks ago that Gilgenbach had a chance to be a double-digit home run guy, and he certainly looks well on his way to clearing that mark. Gilgenbach has made big strides with his approach after striking out 23 times in 51 at-bats a year ago. “Gilgy started in our lineup early in the year last year, really struggled, swung and missed a lot. I think one of the things that led to him having some success in the latter half of the year when he got back into the lineup was that he was able to take the swings and misses, which I think to a certain extent is a part of the game for a kid with the power he’s got — I think he was able to put those swings and misses behind him,” Aoki said. “I also think he was able to cut down on as many swings and misses he had early in the year. He’s a kid who has power, he needs to trust that. He always gets himself in trouble when he tries to force it. I think that he has slowly began to buy into the idea that if he makes solid contact enough, by virtue of the fact that he’s a kid that has power in his bat, some of those balls are going to leave the yard. Notre Dame’s pitching is still a work in progress — that’s where this team is really young. Ristano predicted that this “should be a mix and match staff, lots of guys with high appearances, low innings.” And indeed, 13 different Notre Dame pitchers made appearances over the weekend, but the Irish did at least get five innings apiece from their first two starters, wily veteran lefthander Scott Tully and freshman southpaw Tommy Sheehan, who surrendered four earned runs apiece but gave their team a chance. The return of Tully from back surgery is huge for Notre Dame; he’s a fifth-year senior with advanced feel for pitching — he’ll vary his tempo and constantly change speeds, mixing a mid-80s fastball with two different breaking balls he can throw for strikes and an “elite-level” changeup, as Ristano put it. Sheehan has more arm strength, with an upper-80s to low-90s fastball from a high-three quarters slot with good deception and life. Ristano said his secondary stuff was a work in progress, and he didn’t have his best feel for it this weekend, but still battled his way through five innings. Another freshman who came up big is 6-foot-5, 256-pound lefty Cole Kmet, who threw four innings of one-hit, shutout relief Saturday. He was a big wild card coming into the season because he spent his fall playing tight end for the football team, rather than working out with the Irish. Ristano said he has some feel for pitching with an upper-80s fastball, and he also has enormous raw power at the plate, though he didn’t log any at-bats this weekend. Considering the Irish weren’t sure exactly what to expect from him, Kmet’s composure on the mound in his college debut was awfully impressive. Notre Dame’s highest-profile freshman, 6-foot-7 righty Joe Boyle, made his debut Sunday and retired the only batter he faced. But he did it in eye-opening fashion, running his heater up to 98-99 mph. As he refines his command, he’s got a chance to be very special, with that kind of frame and arm strength. Notre Dame’s most effective pitchers Sunday were sophomore righthander Cameron Junker and Andrew Belcik, who combined for less than two innings last year. Like most of the arms on this staff, they really got their feet wet down in Baton Rouge, and the early returns were very encouraging. Junker, a power pitcher with a 90-93 fastball, a good slider and a developing changeup, made some progress last summer in the New England Collegiate Baseball League and carried his progress into the fall. He started the rubber game and allowed just one run on one hit and two walks in 3.1 innings. At the back end of the game, Belcik worked 2.1 scoreless frames, yielding just one hit and one walk while fanning two. He’s yet another big-bodied pitcher (6-foot-3, 236 pounds) who “looks like he’s pitching in shoulder pads,” as Ristano put it. His calling card is a good sinker that can bump the low 90s, but his slider can also be an out pitch. Overall, Notre Dame’s staff posted a 5.19 ERA and an ugly 21-13 walk-strikeout mark on the weekend, so questions linger about this team’s staying power. Obviously the Irish will need to pitch better to sustain their early success. But as Aoki put it, the Irish would much rather be in this position than start out 1-8 like they did a year ago.